If you have installed and working on latest Magento’s Enterprise Edition 1.9.0.0, you could find some strange behavior with 404 error page and landing page. People say there is a patch for this, but I would like to present a quick fix for those of you who need an urgent solution. Issue is that you’ll get status 200 OK for each non-existing CMS page or controller and you will be redirected to home page. Bug is in class Mage_Core_Controller_Varien_Router_Default, at line 42. Do not edit this core file, since it’s Magento Enterprise Edition! i have upload two magento projects on same domain in folder httpdoc first project is running fine the second project i have made a beta folder in httpdoc and create here but i am facing 404 Error on home page images are displaying but other things are not working. Can any body tell me the solutions??? By the way I forgot to tell you that they have changed the way “private sales” works ..now you do not need any physical directory. Professional 1.9 – same problem, same fix. Thanks! The whole magento 1.9 is buggy .A clean install is not possible with this.I have faced many difficulties with this version.But at the last i make it working anyhow. 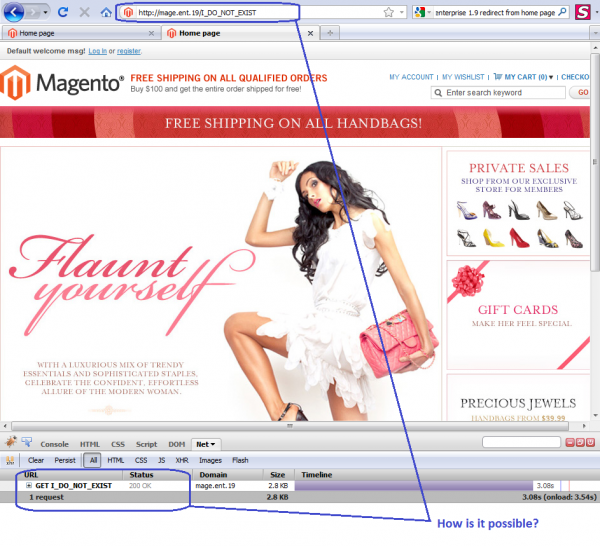 I have also faced this problem when i am upgrading a website from magento CE to EE 1.9. Thanks for notice. We don’t think that there is any harm in pointing to something that will be helpful, but we understand that presenting block of code could be interpreted in different ways. Anyway, we updated the post a little and removed the larger code block and left only instructions. Welcome to Magento Partners Club. The first rule of Magento Partners Club is: you do not talk about EE bugs. The second rule of Magento Partners Club is: you DO NOT talk about EE bugs! Wouldn’t post EE code either… I don’t think they’ll be happy with this.